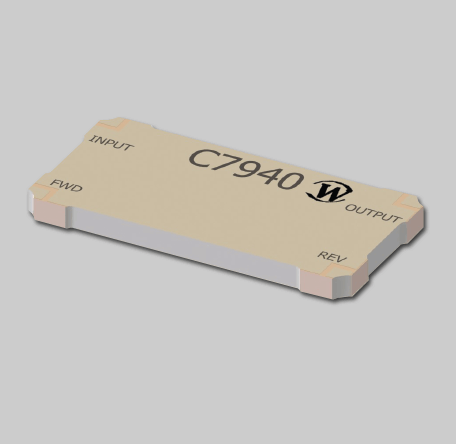 Werlatone's patented line of Surface Mount Directional Couplers continues with Model C7940. This 20 dB, Bi-Directional Coupler, covers the full 450-2500 MHz band, and is rated at 100 W CW. Measuring just 1.3 x 0.65 x 0.09", this fully bonded design operates with only 0.3 dB of Insertion Loss across the entire operating band. Werlatone’s patented line of Surface Mount Directional Couplers continues with Model C7940. This 20 dB, Bi-Directional Coupler, covers the full 450-2500 MHz band, and is rated at 100 W CW. Measuring just 1.3 x 0.65 x 0.09″, this fully bonded design operates with only 0.3 dB of Insertion Loss across the entire operating band.